Writing in the current StarChefs, Heather Sperling discusses how delicious economical meats---including heart, tongue, sweetbreads, and marrow bones---can be when grilled. The French-trained Argentinian chef Francis Mallmann, for example, slow-cooks sweetbreads over a heap of hot, ash-covered wood embers; cooked long and slow enough, they lose their fat, becoming crisp and tender. All they need is a sprinkle of coarse salt and a squeeze of fresh lemon, and they’re ready to eat. Sperling cites a few chefs who swear by beef heart, including Chris Cosentino of San Francisco’s Incanto. 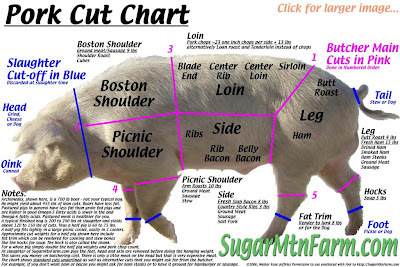 A well-trimmed been heart is essentially a large piece of red, flavor-filled meat. 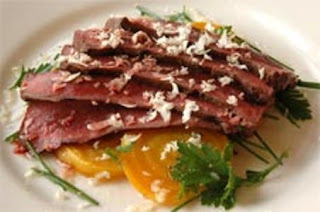 One of his heart recipes: Grilled Beef Heart with Roasted Golden Beets & Horseradish (see photo immediately below). Many people are disinclined to tackle cooking or eating innards. When it comes to tackling economical meats, they might be more happy with something like pork blade steak. Cut from pork shoulder, blade steaks are well-marbled and flavorful. Preheat the oven to 425°F. Boil the potatoes in salted water until they are slightly overcooked. Strain the potatoes and spread them evenly on a sheet pan; allow to cool. Once the potatoes are cooled, toss with olive oil and season with pepper. Roast until golden-brown. In a mixer with a paddle attachment, whip together the butter, salt and lemon juice. Once the butter is whipped and the lemon juice is completely incorporated, fold in the chives, parsley and thyme. Add the olive oil to a sauté pan over medium-high heat. Once the oil starts to shimmer, add the greens and quickly season with salt and pepper. Squeeze the juice from the lemon over the greens and remove from the heat. Season the pork shoulder blade steaks with salt and pepper. Rub with olive oil and grill over wood or charcoals. If you'd like to know more about the maker of the poster shown at the top, contact Sugar Mountain Farm. 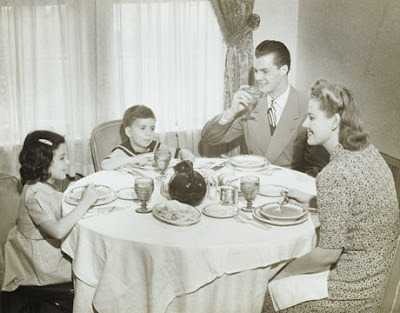 According to a recent study by Information Resources, Inc. (IRI), economic pressures in the US have created a revival of the family dinner—home-cooked meals featuring fresh ingredients. More than 60% of consumers reported that they were visiting restaurants less often than in the recent past. Other trends include a renaissance of the home garden and a significant growth in foot traffic at farmers’ markets. At a loss for what to give dad this coming Sunday? 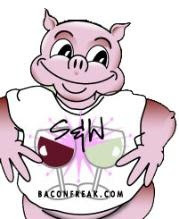 How about a membership in the Swine & Wine Club? Yes, indeed: the Gourmet Bacon-of-the-Month Club and the Premium Quality Wine-of-the-Month Club have joined forces to form this unusual venture---perfect for dads who dig bacon and wine. Each month dad will receive a full pound of top quality bacon along with a bottle of "boutique-quality" wine (you can specify red or white when joining). Both the bacon and wine clubs are offshoots of Coastal Vineyards of Moorpark, California. CV must be run by some pretty amusing people. You'll see why if you explore the website, which is wacky and funny. They actually have a dozen or so monthly clubs, including jelly, olive oil, lobster, BBQ sauce, and steak clubs. Dinner two nights ago in San Francisco at La Mar Cebicheria Peruana. Located on the city’s Embarcadero at Pier 1½---next to the Ferry Building---the 8000-square-foot, high-ceilinged and superbly modern restaurant is divided into three sections. At the front is a roomy bar; in the center, a long ceviche bar where diners can enjoy the sight of chefs hard at work; and a spacious dining room (opening onto a patio and the water). In other words, this place is the perfect destination for anyone wanting to relax over a drink (Pisco cocktails are definitely the thing here), enjoy a light meal, or slip into an all-out feast of high-end, Japanese-influenced Peruvian cuisine. Anyway, back to La Mar! You can eat in a variety of ways here. For instance, you could make a wonderful meal by choosing to share a diversity of appetizers. Or you could go the traditional route, choosing your own appetizer and a main course. We opted for the middle course, sharing appetizers and then each choosing a main course. As you’d expect, there were many ceviches from which to choose (we opted for the cebiche crudo: shrimp, sea urchin and scallops in sea urchin leche de tigre). If you can’t decide, you can do a tasting of four cebiches. I’d had causas before in Peru---they’re whipped potatoes topped with other ingredients. It’s traditional food, usually delicious and always hearty. At La Mar causas become a work of art. 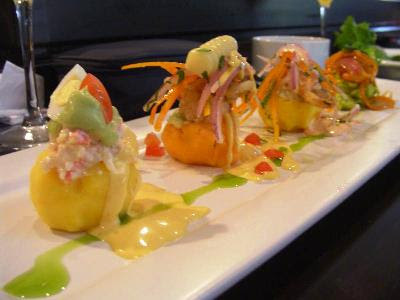 Rather than choose one of the five or six on the menu, we did the causa tasting; my favorite was causa limena (potatoes topped with Dungeness Crab, avocado puree, quail egg, cherry tomatoes, aji amarillo Huancaina sauce, with basil cilantro oil). Yow! Other appetizer sections consists of tiraditos (a Peruvian version of Italy’s carpaccio), soup, anticuchos (Peruvian grilled skewers), empanadas, and a lot more. For a main, my companion went for Cau Cau (roasted scallops in a clam and mint broth with tiny potatoes, sweet peas, and corn risotto), while I had the risotto-like regional rice dish, arroz jugoso (prawns, clams, mussels, calamari, octopus, white fish and veggies, arborio rice, Peruvian flavors). Quite delish. I had fond memories of drinking pisco sours each night of my multi-day hiking trek through the Andes to Macchu Picchu years ago, so I did try one of the pisco cocktails. Good, but way too sweet for me. Next time I’ll stick with a dry South American wine or one of the lovely sakes on the menu. A couple of other notes... (1) The atmosphere was high-energy, with a really good feel. (2) When you sit at the table, you're presented with a basket of just-fried potato chips and a platter of three dipping sauces; it was hard to stop devouring this little treat. (3) Next time I think I'm going to stick to the appetizer side of the menu. But, then, who knows...? If you’re an adventurous eater, you’ve got to try this place. 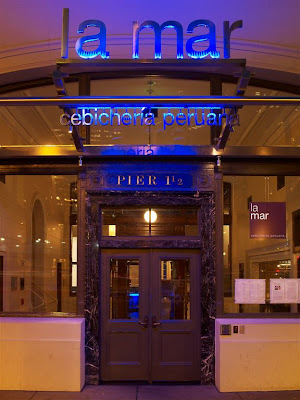 La Mar Cebicheria Peruana has branches in Lima, Peru; Mexico City; Santiago, Chile; and Sao Paulo, Brazil. This year the restaurant opens in New York, San Diego and Los Angeles. Keep an eye out! For some inspiration, you might want to download the dinner menu.